Welcome to Lucas King's CMPE 3 Webpage! This is a project for CMPE 3 so it's nothing too fancy. I'm a UCSC undergraduate (at the moment) majoring in Molecular, Cell, and Developmental Biology. 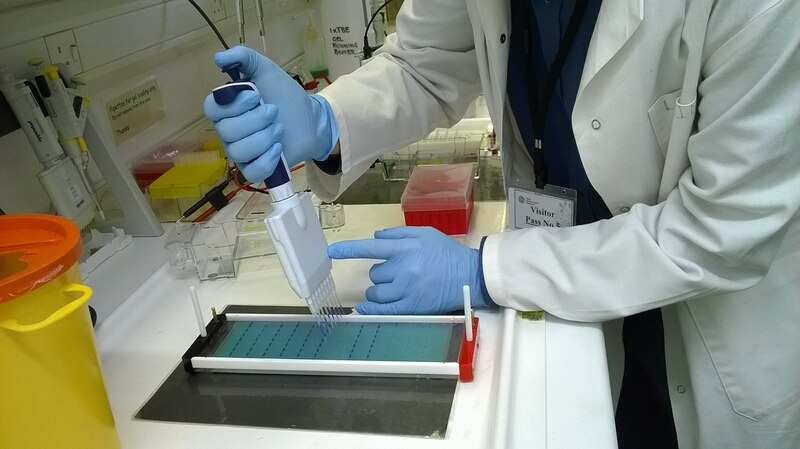 Here's a picture of a biologist loading an agarose gel to run Gel Electrophoresis, a technique for separating fragments of DNA based on size. Here is a Wikipedia article describing Gel Electrophoresis. My micropipette (the tool they are holding) had only 1 tip, so I had to do a lot more work! My gel (the light blue block) was a lot shorter, so I had to do a lot less work! I didn't have as many samples (the dark blue liquid) to analyze, so a lot of wells (the little blue lines) were not filled. The plastic tray for the gel was much deeper and held a lot more liquid. In order to stay safe during these procedures we have to follow some rules. Put on a lab coat to protect from splashes. The liquids we work with contain acids, bases, and other chemicals toxic to DNA. Put on a pair of goggles to protect our eyes. Some liquids turn into gases at room temperature, or are heated to boiling temperatures. Put on a pair of gloves. Small spills might be inevitable, so protect the skin on your hands! No rough-housing in the lab space! Glass can break, chemicals can spill, and expensive equipment could be damaged! That's all I've got to write for this assignment! If you need to email me, you can send an email here but it had better be important!